So tomorrow is my last day in Haiti. After leaving our hotel, we stopped by the Art Creation Foundation for Children (ACFFC), to say goodbye to the children. I was very anxious; would I be able to see the girls I have had become so close to over the last six days? Would they feel the same heartache I did? Would they remember me? Within minutes, I had my answer. As I walked in the building, Geraldine, my new hairstylist and fast friend, came running toward me, threw her arms around me and gave me one of the biggest hugs I have ever felt. Instantly, I felt everything; all the love, the sweet grace and joy that was inside her. Earnest, you-are-not-just-my friend love. It was bigger than that. Much, much bigger. Over the span of a few days, we had played, and spoken to each other in gestures, broken pieces of my high school French, the few words of Creole I had just added to my vocabulary, and English we could muster. Most importantly, we spoke in touches and smiles, and endless laughter (apparently, I had the worst, most humorous French accent in the entire world). Those are the things that need no words; they are universally understood. As I made my way up to the second floor, a boy I did not even spend a lot of time with, also gave me a hug. I did not even know he was there. He was small and I had not seen him coming. He smiled up at me and looked into my eyes, and I felt my heart melt all over again. The look in his wide, beautiful, brown, doe-like eyes and instantly everything in the chaos of the center blew away, like smoke in the air. All I could feel was gratitude, which I returned fourfold. Then I turned around and was enveloped in the arms of the girl I had been most hoping to find, Jessia. When we first came to the center, only a few short days ago, I saw her looking at me. This happened a few times, I had smiled at her each time, and she always smiled back. During one of the many times the girls had combed, braided, and re-braided my hair, they peppered me with questions about me and my family: did I have a husband? Where did I live? How old am I? Did I have brothers and sisters? What is my favorite color? Did I have a dog? I answered each question patiently as they probed into every aspect of my life, and I asked them everything I could think of about them. Finally, the question came up; did I have any children? As best I could, I told them that my husband, Carl, and I had no children. Of course, they wanted to know why. It took several tries, but finally they understood, at least to the best the young girls’ abilities, that I had had cancer, so that I could not have babies. I was good with that…it was one of those things that just happened. I no longer feel any sadness over it. They processed the info, chatting among themselves. Then Jessia, the girl who had been watching me, and smiling at me, came up to me and said in French, “Je suis votre bébé, et vous êtes ma maman (I am your baby, and you are my mama).” She took my hand and said it again. I choked back tears of joy and appreciation, and said, “Tu es mon bébé et ma nouvelle famille.” She understood; she was my baby, and my new family. She and I embraced fiercely. Everyone in our group of volunteers were getting back on the bus to leave Jacmel and travel to Port-au-Prince. Neither of us let go; we wanted to hug each other for ever, and never let go, but we finally did. I kissed her and said, “Tu es mon bébé, mon beau bébé. Je t’aime. (You are my baby, my beautiful baby. I love you).” I love her, and always will. This trip has changed me. I have so much to be grateful for, and I will go see her and the others as soon as I can. 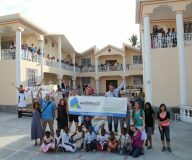 It’s kind of funny; before I came to Haiti with Random Acts, Haiti was in my heart. 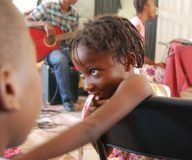 Now, as we prepare to fly home, my heart is in Haiti. My heart is in Jessia. That fills me with joy. It is worth more than all the gold in the world. I knew we were going to Haiti to help her heal, and in the end, Haiti has healed me, in ways that words could never describe. For that, I am eternally grateful.